Next Wednesday May 13 I’ll be leading a workshop on “The Power of Stories in Learning” as part of the Association for Talent Development (ATD–formerly ASTD) Learning Leaders Forum. It takes place at Con-Way from 8 – 10:30 AM. During the workshop, we’ll go over why story-based training design enhances learner attention and outcomes; practical tips and techniques for designing learning experiences with a narrative structure; and a framework for transforming boring training into a compelling adventure. If you’re interested, register on the ATD website. Hope to see you there! I’ve had my eye on the Center for Digital Storytelling for a couple years, and this past week the timing finally worked out for me to take one of their workshops. I decided to make it an adventure and take a 10-hour road trip from Portland to Berkeley. The premise of the three-day workshop is to take a story from your life and turn it into a brief video (fewer than five minutes long), including voiceover, images, text overlays, and effects. Many of the stories participants create are poignant and moving, with topics related to family dynamics, illness, social justice, public health, and activism. The story I chose for my project concerned a question I had the youthful nerve to ask, and the amazing result. Here is my video about the time the Ramones played at my tiny Longwood College in Farmville, Virginia. The process of creating the video was trickier than I thought. First of all, I showed up with an 800-word script. With the help of the workshop facilitator and the participants, I ditched a lot of the detail and was able to carve out a story that stands on its own, more effectively without all the exposition. Writing for video is a special skill that takes time to develop. It’s too easy to be redundant. The workshop helped me refine my ability to remove the fluff and balance the visuals with the narration. I loved my experience at the Story Center and recommend it to anyone seeking professional development or time to focus on a personal story project. Humans naturally learn through stories. When we hear a good story, our brains release oxytocin, the “cuddle chemical” associated with empathy, cooperation, willingness to help others, and enhanced social cues. Setup: Introduce characters, setting, and situation or problem. Conflict: Elaborate on the problem. Resolution: Work out the conflict, and come to a conclusion. One or more of the characters has gone through a transformation by the time the situation is resolved. You can add more layers and complexity to a story by using tried-and-true models like Joseph Campbell’s The Hero’s Journey or the more modern dramatica model for story structure. Stories have the ability to trigger multiple areas of the brain simultaneously. The sensory portions of our brains that process what we see, taste, hear, and experience through physical movement are activated when we’re immersed in narrative, according to studies done at the Dynamic Cognition Laboratory at Washington University. The primary sensory motor region of the brain even changes when immersed in a story. Any topic worthy of training can be made more compelling by infusing it with narrative. If you’re leaving stories out of your training, you’re missing an opportunity to engage for authentic learning. Let’s look at two ways to incorporate narrative or story elements into training materials. 1. Present the content within the framework of a story. You can take the most boring information and transform it into something interesting by framing it in a story. Here are a few high-level examples of how you can approach two different topics. Client 1: A car sales company wants to create an online training course to complement a face-to-face class they’re developing for new employees about their mentoring program. 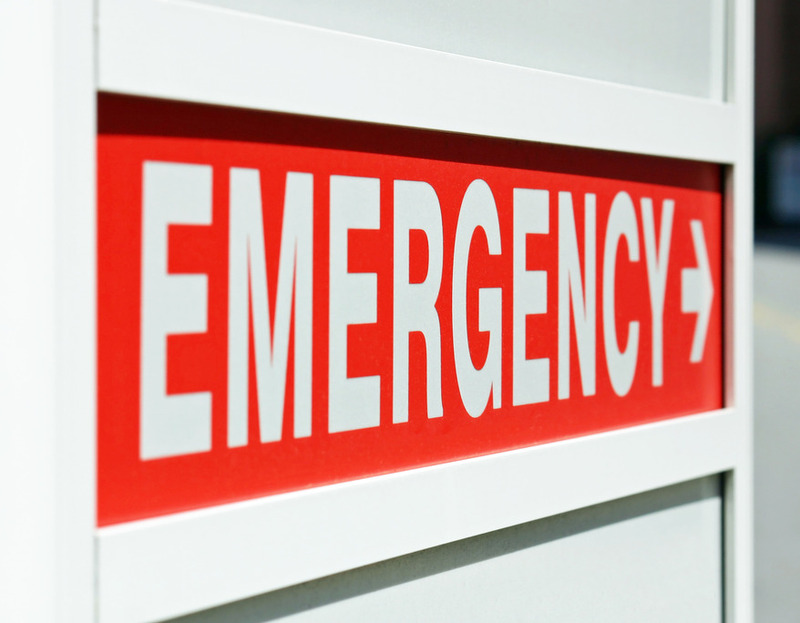 Client 2: A medical supply company wants to teach physicians how to use new three types of new equipment proven to speed up diagnostics and improve recovery. 2. Cast your learner as a character within a story, and give the learner a challenge to solve within that story. Involving the learner directly in the action prompts emotional connection, gives her a stake in the outcome, and increases the likelihood that she’ll actually care about the information. Here are two examples of this approach. Client 1: A public university needs to train its human resources staff on new laws related to harassment in the workplace. They already have classroom training and would like to give participants the chance to refresh their knowledge in an online course. Client 2: An online retailer needs to train its staff on improving its customer service. You don’t need to be a card-carrying raconteur or have a giant budget. Anyone can infuse learning materials with story by researching what’s relevant for your audience and creating challenges that ring true to them in real life. In next week’s post, I’ll talk about a five-step process for creating a compelling story-based learning experience. 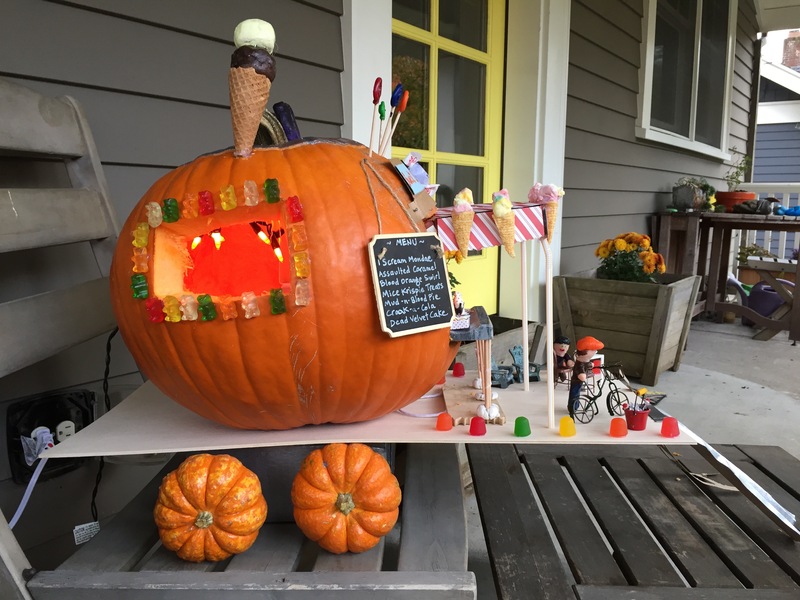 During the week of Halloween each year, I dress up a pumpkin. 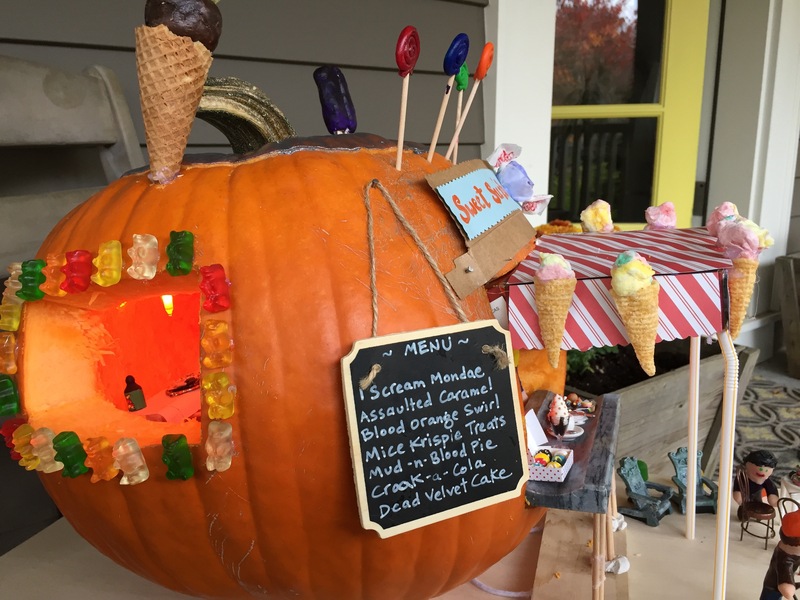 Not as a pumpkin…I dress up the pumpkin itself. I find pumpkins to be the perfect vessels for fleshing out a scene. Over the past dozen years I’ve been inspired by three themes: amusement parks, twisted fairy tales, and ghoulish vices. I compiled some highlights here. 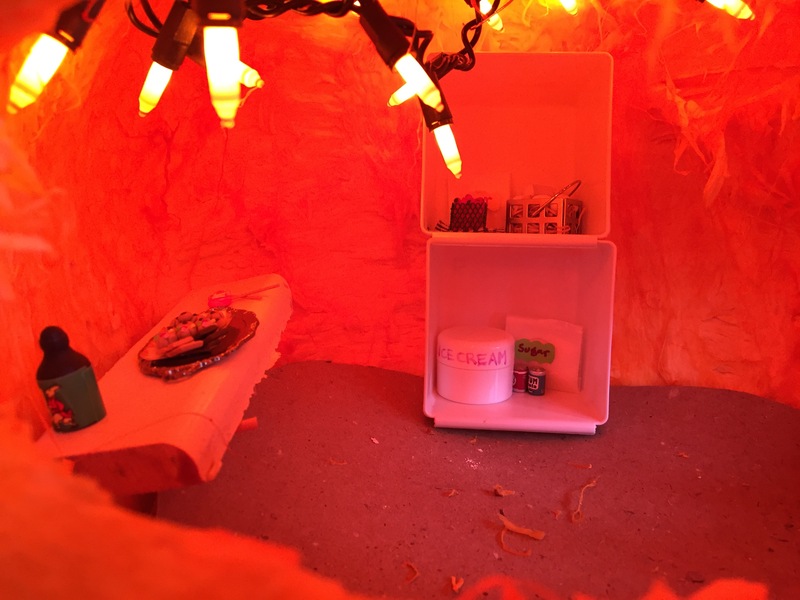 I tend to spend a ridiculous amount of time thinking about it, collecting materials from thrift and art supplies stores, and then finally creating the scene every year. 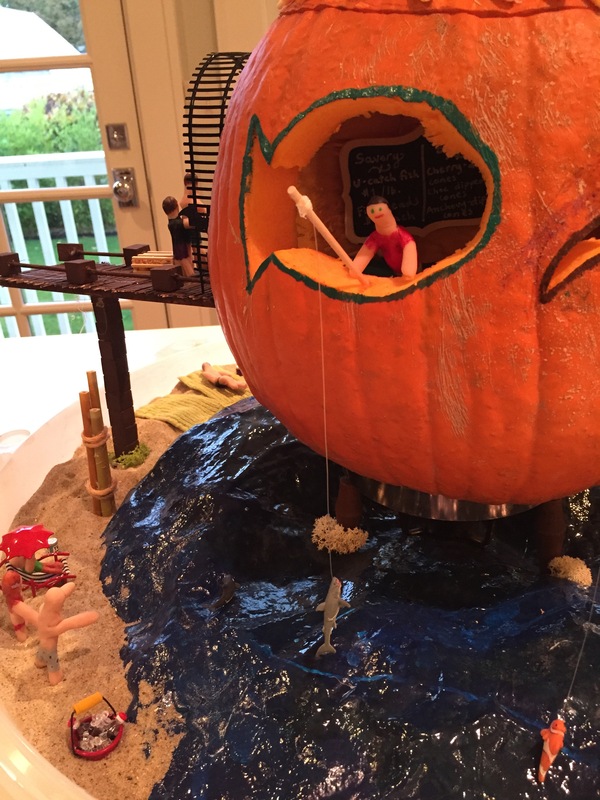 I’m more interested in props and scenery than I am in actually carving the pumpkin. 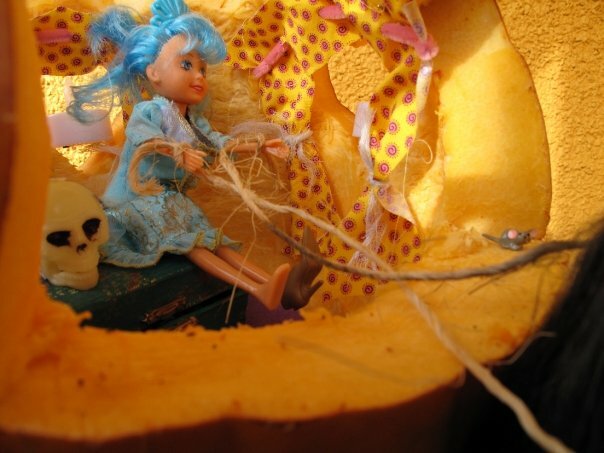 You’ll notice many of my gourds have a simple hole cut out, and the story is depicted inside it. 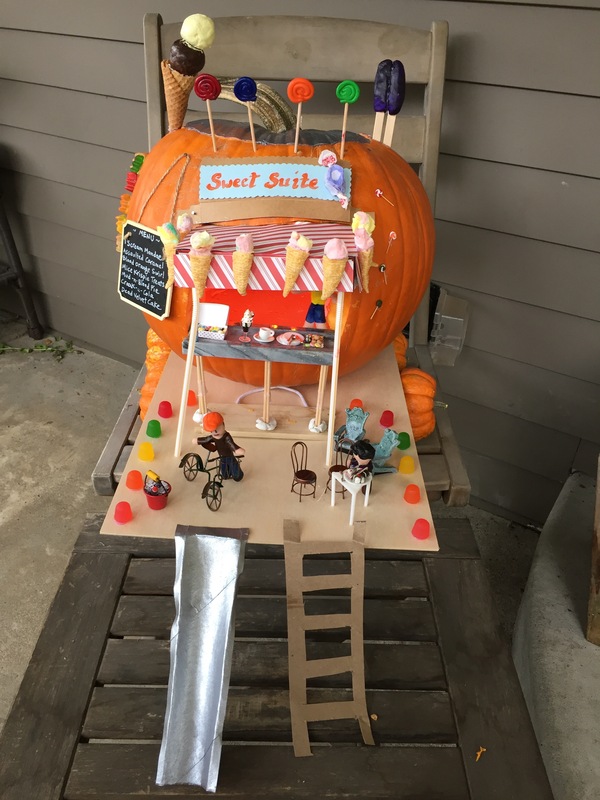 Maybe this is a result of the one year when I spent six hours carving a pumpkin into a merry-go-round, painting it, only to have the pumpkin almost collapse on itself (I saved it by reinforcing it with dozens of nails). A lesson in physics: carve less open space next time. When my daughter was three, she was terrified of the wicked stepmother from Snow White. 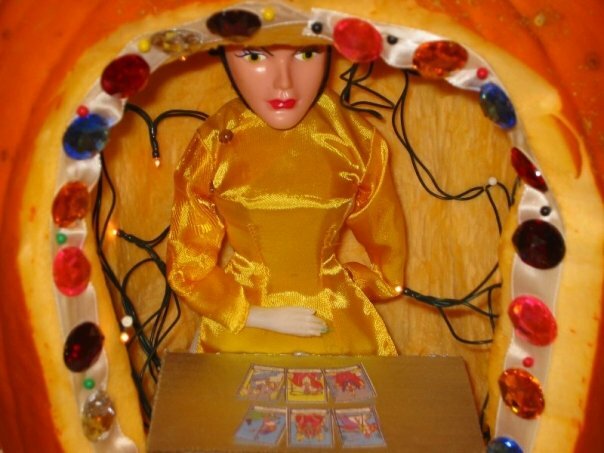 So it was a joy for me that year to put “that mean lady into the pumpkin” as a creepy but harmless tarot card reader. The Wicked Stepmother is trapped in a fortune telling booth. My daughter now thought the evil lady was funny, and no longer scary. I wish I had a better picture of this. It’s Peter Pumpkin Eater’s wife’s side of the story. 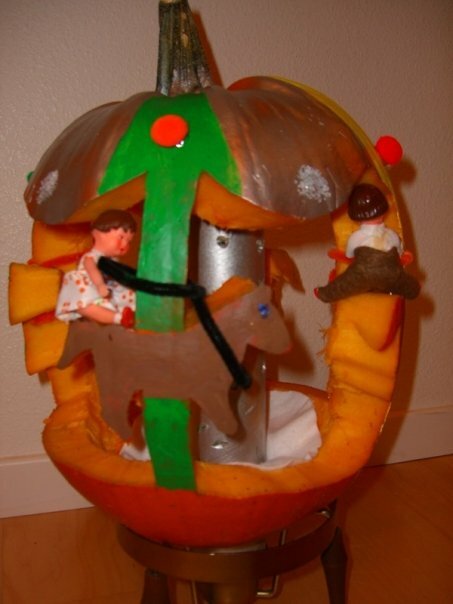 It included a long poem that I unfortunately can’t find, detailing how she planned her escape from the pumpkin prison. Scenery includes curtains, a table, a smoking chimney, and a plant in the window. 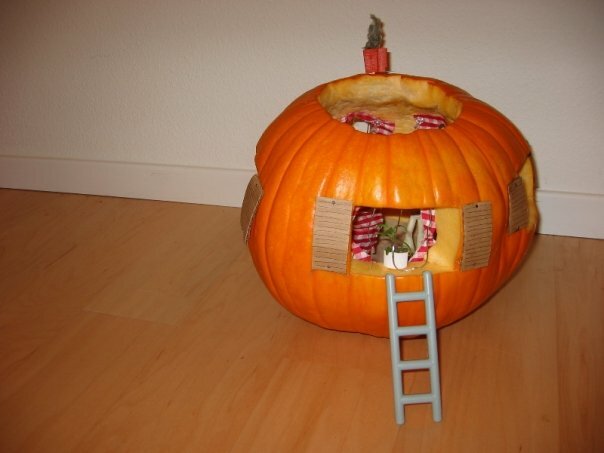 Peter Pumpkin Eater’s wife actually had an escape plan in this twisted tale. 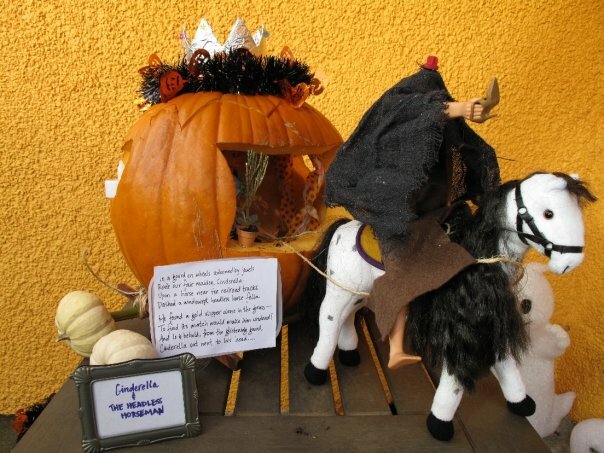 The headless horseman might appear to be steering the chariot, but look who’s got the reins. 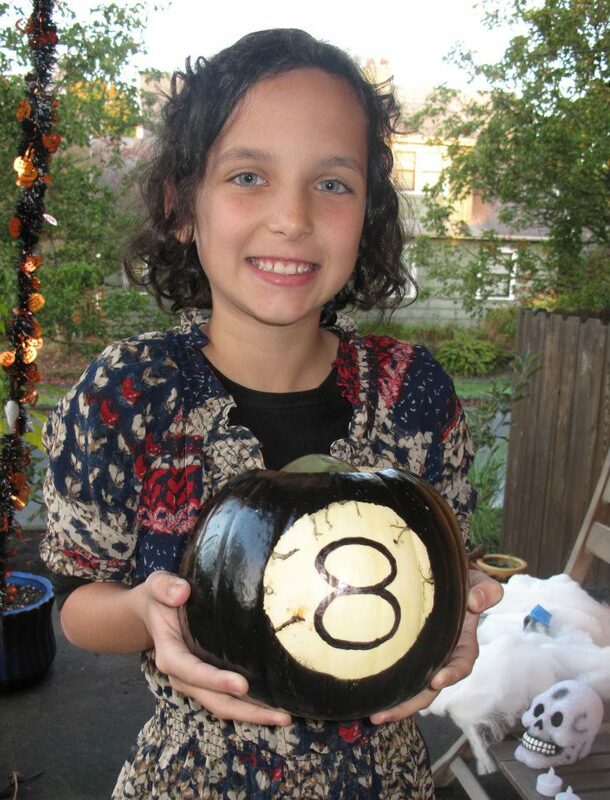 The Magic 8-Ball pumpkin was challenging but we came up with a great plan. 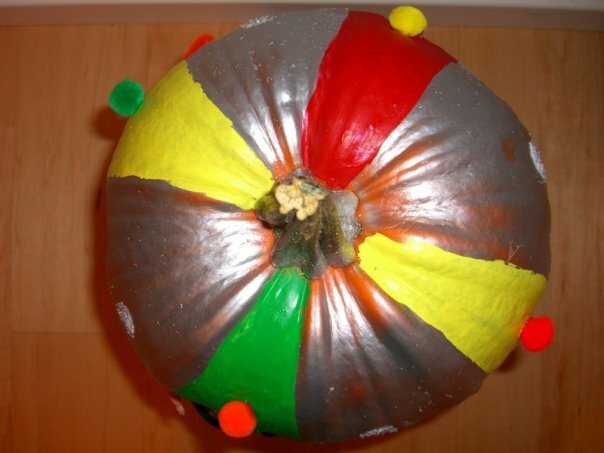 I started with a white pumpkin, painted it, and then filled a balloon with glycerin. 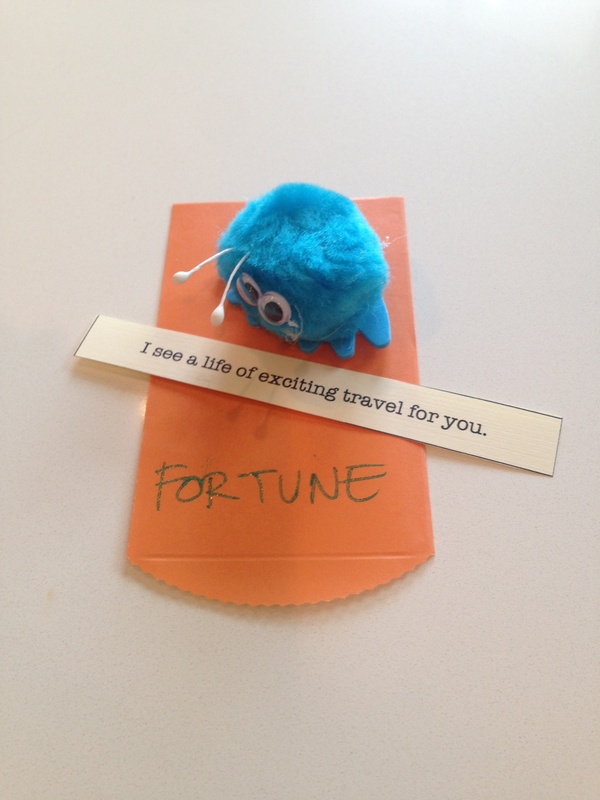 Inside the balloon was a foam square with brief fortunes on all sides. 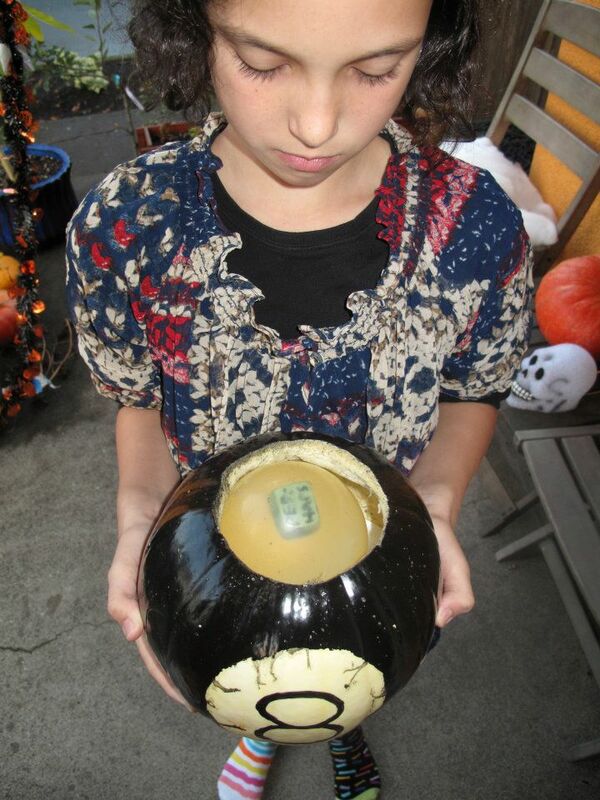 Just shake the pumpkin, and a new fortune floats to the top. Magic 8-ball that actually works! 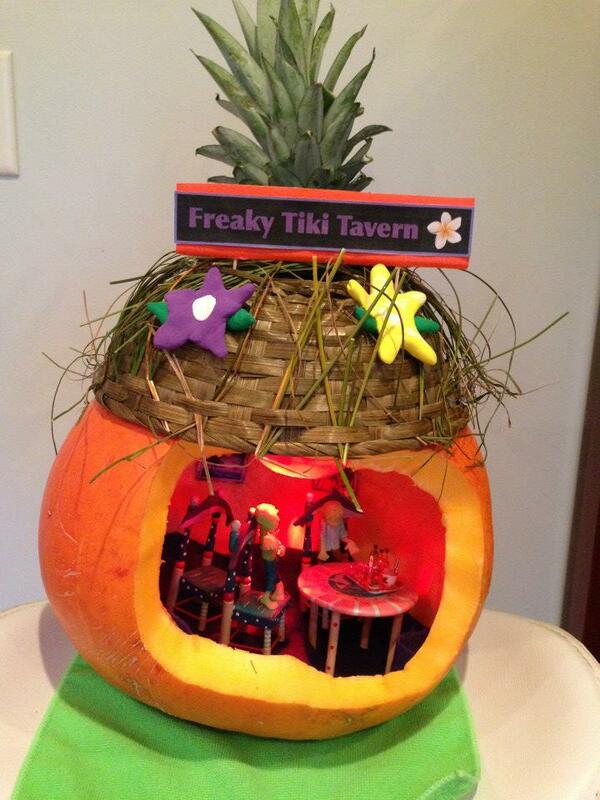 This Freaky Tiki Tavern was inspired after a trip to Hawaii the previous summer. I used a pineapple and a wicker basket to fashion the rooftop. 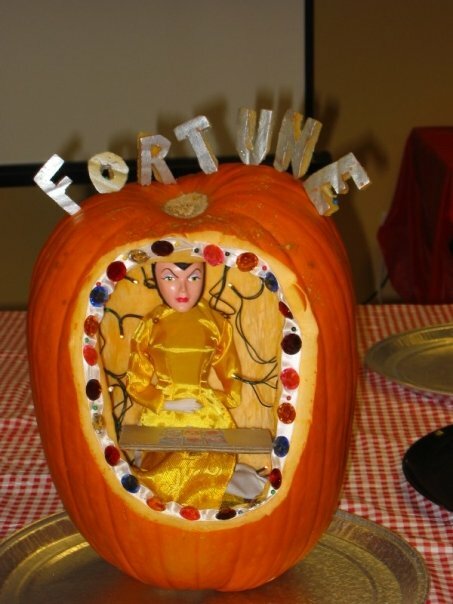 The 2014 pumpkin: Introducing Madame Zalameda, crystal ball fortune teller. I combined a claw machine with an amusement-park-style fortune telling machine (inspired by Zoltar). 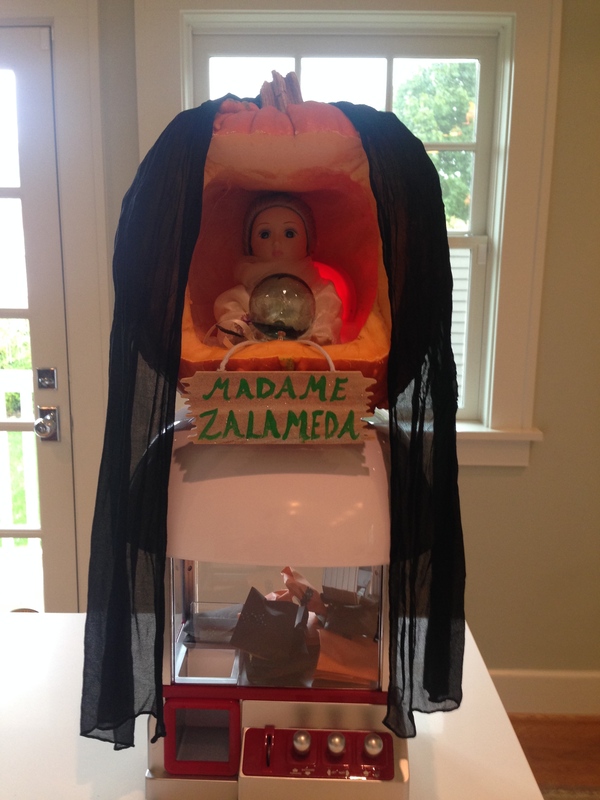 Step right up and get your fortune from Madame Zalameda. 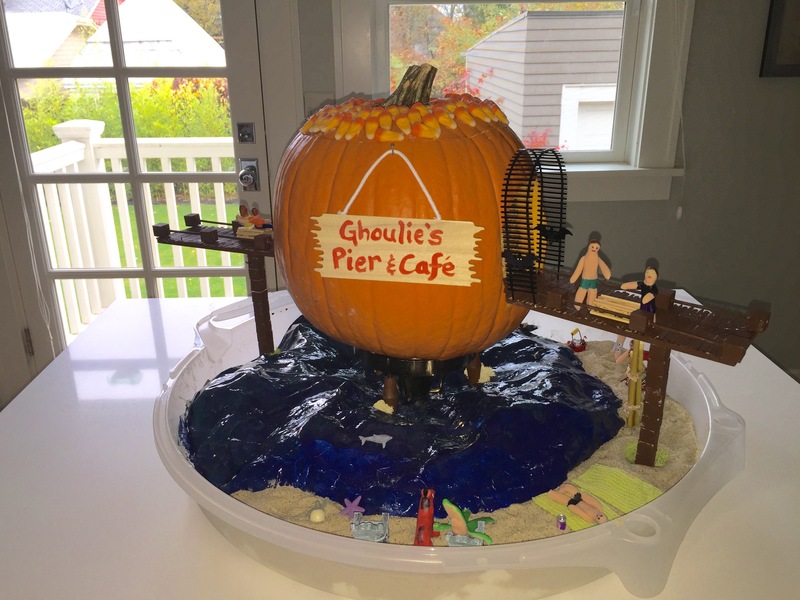 Pumpkin for 2015: My favorite pumpkin yet is Ghoulie’s Pier & Cafe. The sand actually came from North Carolina. 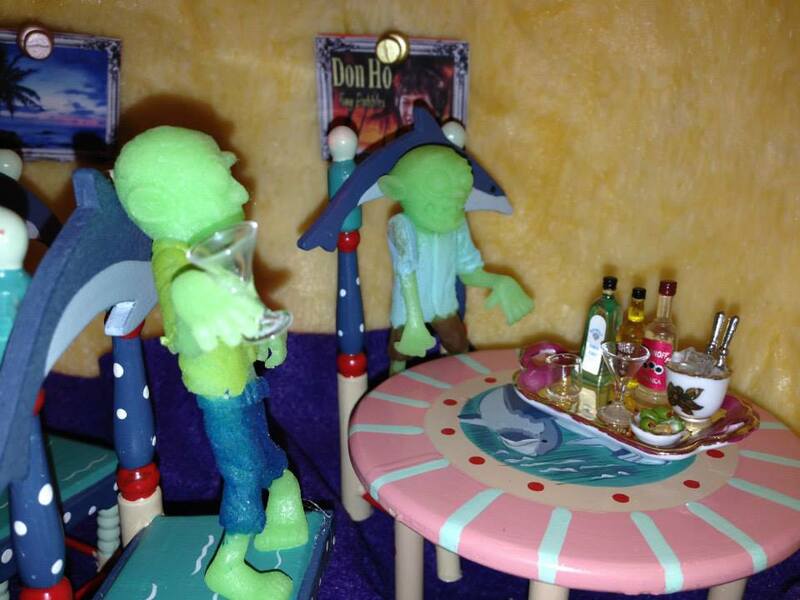 I used paper mache for the water. 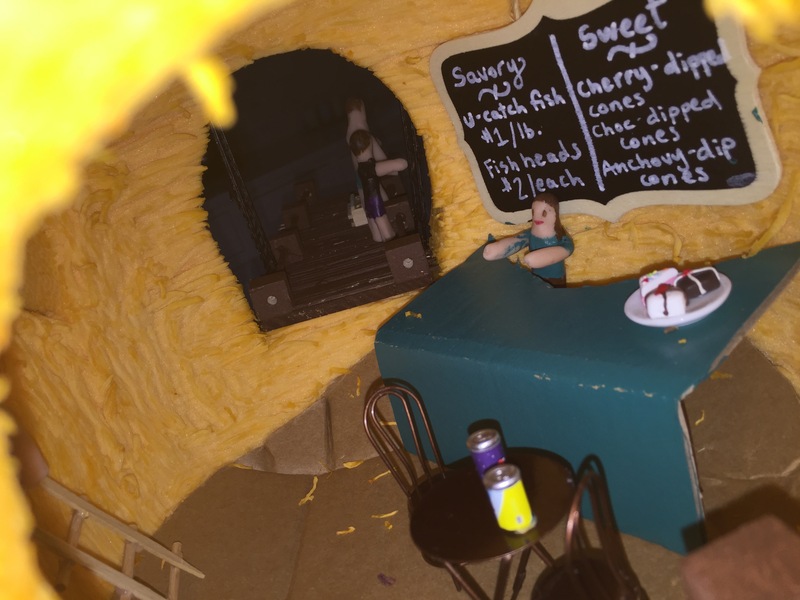 It took about five days to make. 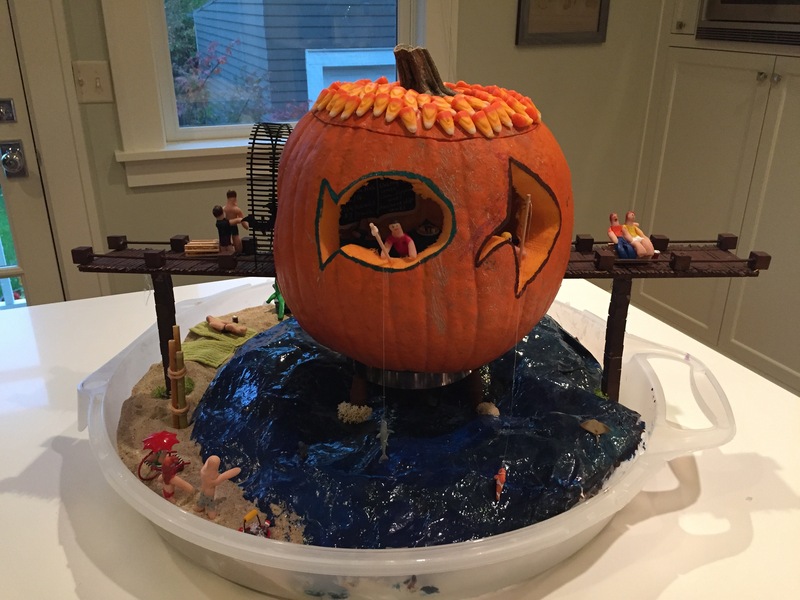 Pumpkin 2018 is in the works, and it’s going to be awesome. I created this exercise as part of my Story-based Instructional Design session for the ASTD-Cascadia conference. It’s a tool you can use with another person or by yourself to practice adapting training content into a story structure. Pick a training topic, answer a few questions, and then begin shaping your topic into a story. So this was my introduction to the future of technology. Fear, cynicism, and the sense that we might as well give in now, because it’s going to take over in the end anyway. Cold, mechanical, impersonal. Thankfully, my first impression of our horrible computerized future was quickly replaced with an awe for technology that I developed in second grade when I received a Speak & Spell for my birthday. As archaic as it might seem now, Speak & Spell opened new worlds (and words) for me. Sure, its voice was creepy. But it “listened” to me and adjusted the level of difficulty as I responded. And I became a fabulous speller. Speak & Spell even had a special “decoder” that translated every letter in the alphabet into a different letter. I memorized this code and used it to write notes to my friend who had also memorized the code. Speak & Spell was just the gateway. I moved on to Speak & Read, Speak & Math, Commodore 64, Atari 2600, Apple IIe, etc. The graphics and effects were all so pixelated and simple. But sometimes it’s easier to grasp the story when there’s not much flash and clutter. And I think it’s the straightforwardness of the early computing systems that makes them seem not only charming today, but quite effective in retrospect. During a visit to a Chuck E. Cheese-type of venue years ago with my young daughter, I noticed that she was initially attracted to the noisy, flashy machines. But she ended up spending more time with the games that had a clear purpose and a mission that she understood within the first 10 seconds. If she didn’t “get it” in a reasonable amount of time, she walked away. These experiences and observations inspire me today in designing content for interactive learning. My goal is creating engaging experiences with a hook, a purpose, and a voice that people really want to listen to. People should know what they’re getting into right away. They want to be involved. And so I work on combining the great things that have evolved in technology–like smooth effects, transitions and layering of interactivity–with the age-old principles of storytelling to draw the learner in. Minus the creepy voice, of course. When designing how a training course begins for your learners, flavor your approach with less Do Re Mi and more In Medias Res. No matter how linear the content, no matter how compliant-heavy the material, you don’t need to bore your learners with a lot of set-up. Throw them right in–most adult learners will thrive on the immediate challenge! Make sure your two-way radio is functioning properly. Avoid smoking at all times. Which “grand opening” piqued your interest the most? The learning objectives can still be the same with either approach. The second example goes right to the heart of the reason the training exists: There are some safety concerns. People are making mistakes. Empowering your learners to get involved in a scenario from the first moments they’re introduced to the course helps involve them in discovering the solutions to the problems. The difference is that the learner is engaged right away with the second example. Your learners want to be involved. They want to be respected. And they want the content to be relevant and meaningful. Start off with the action and let them discover the details along the way. In organizations, stories do two powerful things: create emotional connection and help people remember. They help you see where the company’s been, where it is right now, and where it’s headed. Every organization has anecdotes people tell to describe their work, their values, and their purpose. Structuring those snippets into a story framework gives an organization coherence and helps it connect with employees, company leaders, and customers. Why go through the trouble? For employees, organizational stories help them discover purpose and make connections between the business values and the work they do. When employees understand the story behind their work, they pass that knowledge on through products and services. The Quest (aka Joseph Campbell’s “The Hero’s Journey“): The hero faces a challenge. At first he dismisses or rejects it, but then decides to take it on. He goes on an adventure. He gains friends and enemies. He has a direct confrontation with an enemy and almost doesn’t make it. He reflects and takes on the challenge once more, ultimately winning. He is then transformed and shares his vision as a teacher or a guide to others. The Origin Tale: The back-story revealing how a company (or its leader) brought the vision to life, with a focus on rags-to-riches. (Think Nike’s origin story about making shoes with a waffle iron and selling them from the back of a car.) Start with the event that fueled the passion that eventually led to the business idea. Include experiments–early company names, product names, or processes that didn’t work. Which moment turned things around and launched you to where you are today? Connect these events to the business values. Context: Where does the story take place? Who’s involved? Introduce the main characters, what they need or want, and any obstacles in the way. If it’s fictional, make sure this is obvious from the beginning. If it’s factual, start with a date or a time in place to help set up the story. Action: What sort of predicament does your main character (hero) experience? Go into some detail about the main conflict. Are there any setbacks? Here you might also address the climax and turning point, and maybe a follow-up confrontation. Results: This is the final phase, where three things take place: the story wraps up, the lesson is revealed, and the reason for telling the story is also stated. Does the hero and the villain live, die, succeed, or fail? How have you used stories in your organization, either internally or externally? This Wednesday I’ll be speaking on the topic of “Actively Involving Learners Through Story” at the BlueVolt LEAP Ahead Conference in downtown Portland. My session will focus on the power of storytelling as a tool of persuasion, how stories can inspire and engage learning, and tips for interviewing subject matter experts during the discovery process. We’ll break into groups and work on creating a story-based instructional outline in a case study. I’m also very excited to attend sessions by some inspiring colleagues and leaders in the field of learning design. (Some of them are speaking at the same time, so it will be hard to choose!) Stacy Friedman will hold sessions on “Content Curation 101,” “Mobile and the Learner Experience,” and “Using Incentives.” Ben Carmel’s topic is “Learning in a Connected Workplace.” Dana Pratt will be speaking on “Training’s Role in Creating the Future.” Judy Katz will speak about “Design Thinking for Learning Experiences.” Jane Bozarth’s topic is “Show Your Work: The New Knowledge Management System.” And Julie Dirksen, author of Design for How People Learn, will present “Talk to the Elephant: Design for Behavior Change.” And that’s not even all! To follow along with the tweets, look for #LEAPahead on twitter on both Wednesday and Thursday this week.